New York is a crowded city — it’s not uncommon to see traffic lined up around every block. The streets are crowded, the subway has delays…so how does anyone commute, or get somewhere in a rush? Answer: We walk. Here’s some tips to help you get around, the New York way. Comfy shoes are essential in this busy city. Those who can strut in heels around the city are not to be messed with — but we’re not all so skilled at dodging subway grates, so the sensible choose sneakers. One of the best things about life in a diverse city is being able to wear whatever you want without the funny looks. But the weather can be less forgiving, and sometimes leaving your front door can mean turning right back around to change. Are you wearing too much? Not enough layers? No matter how prepared you are, you’ll most likely be uncomfortable when entering the subway — the temperature can be way hotter or colder than it feels on the street. Speaking of the weather, walking in the rain and snow is a whole new skill. The grid map of the city simultaneously makes a barrier to the wind and a tunnel for it to whip through — so brace yourself when turning corners. Don’t leave your umbrella open when entering the subway station — you’ll make it harder for those trying to leave. Tip If you can, raise your umbrella over a person coming towards you or position it so it’s under their umbrella, but won’t hit them. New Yorkers who do a lot of walking usually prefer not to drive. But that doesn’t mean we don’t apply the rules of the road while we walk –— think of it as the Flintstones without the cartoon car. Pick a lane – the left or right side of the sidewalk – and move! Just like driving, either keep up the pace or hit the slow lane. 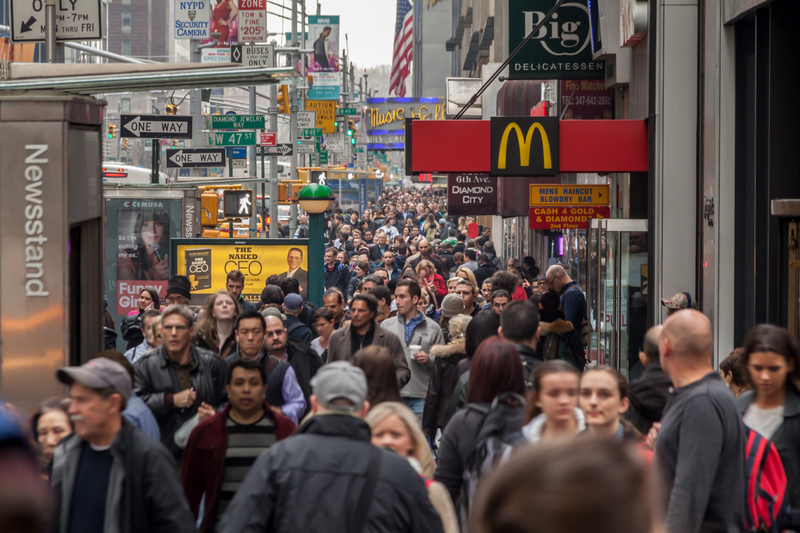 Times Square is definitely one to avoid because of the extreme congestion and slow walking tourists blocking your path — try passing them with the side streets instead. Don’t stop in the middle of the sidewalk!!! Pull over to the side if you need to stop, and avoid causing a collision. If you're lost, got a text, or want to take a picture, find a spot out of the way and keep your spatial awareness engaged. Tip Walking through a crowded sidewalk is a lot like getting to the other side of a busy dance floor — except instead of shimmying between fellow party goers, you’re bobbing and weaving through a family of tourists and men in suits. Navigate carefully and avoid bumping into people. Guilty…a lot of us jaywalk. But even if it feels safe, you should still take precautions. You should always look both ways for both cars and bikes, and other pedestrians too! Yep. There's an unspoken rule of walking on these too, but it's pretty simple. If you’d rather take your time, step to one side (usually your right) and enjoy the ride. For those wanting a boost in your step, the open side (usually the left) is the path for you. Don’t take up the whole step or make it difficult for someone to pass you and your friends. The subway system runs 24/7, but that doesn’t mean it’s immune to delays, skipping stops, or certain trains not running at all...especially on the weekends. Apps like Google Maps, Citymapper, and MYmta are helpful in navigating underground and notifying delays. During rush hour (around 6:30am to 8:30am, and again at 5pm to 7pm) the subway car can get packed. Congrats if you can snag a seat, and if you can’t, squeeze yourself in — treat the packed car like a game of Tetris and adjust yourself to fit/fill in the empty spaces. Don’t block the door when waiting to get on the train — let other passengers get off the train first. And don’t man spread, take up the seat next to you, or hog the pole when the train is packed.